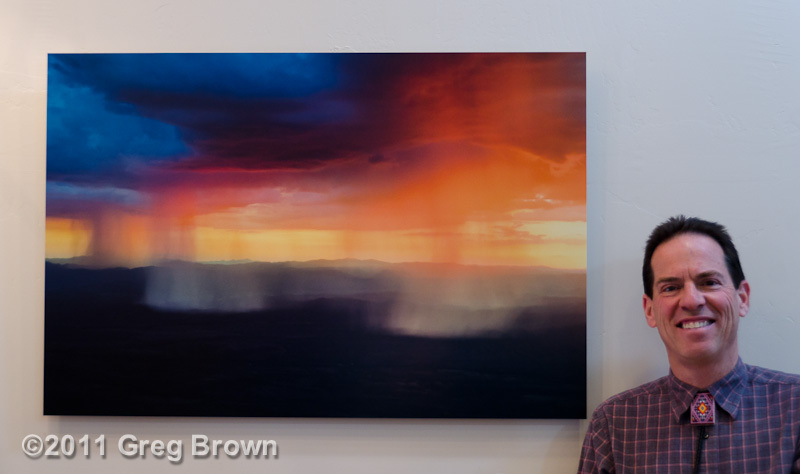 Greg’s affordable new “Sunset Rains” Metal Print! I’m pleased to announce the first of my trendy and affordable new “Views from the Flying Carpet” Metal Prints. Order my new Sunset Rains 20″ x 30″ Metal Print for just $295* through the month of March! I am genuinely thrilled with the quality and fidelity of this series, and believe you will be too. The success of my ongoing museum-quality “Views from the Flying Carpet” Fine Art C-prints crafted by Master Printer Richard Jackson has been incredibly rewarding, with pieces exhibited in numerous museum shows and placed in private and corporate collections as far away as Australia. New Fine Art Print images are in the works. Plenty of folks, however, have expressed eagerness to own a Flying Carpet print while foregoing the cachet of museum quality and collector documentation to fit tighter budgets. Therefore my specific objective with these new metal prints is to offer superb image quality at affordable prices. I selected generous 20″ x 30″ dimensions to deliver the largest possible size while optimizig value and minimizing shipping costs. I predict you’ll be thrilled as I am with these impactful and gorgeous prints. My museum-quality Fine Art collector series C-prints custom-crafted by Master Printer Richard Jackson will of course continue to be available. Although I’ve often photographed the area of “Secret Mountain Sunset” in daylight, never before have I experienced such an opportunity to capture the hulking rock towers of Arizona’s Red Rock / Secret Mountain Wilderness as they slip into night. “Secret Mountain Sunset” debuts in Limited Edition 27″x40″ and 24″x36″ prints, and Open Editions of 16″x24″ and 10″x14″. Print prices start at $175. See detailed pricing and ordering information. PS: Visit my first Phoenix-area Views from the Flying Carpet Arts Fine Art Aerial Photography exhibit at the Arizona Historical Society Museum in Papago Park, Tempe, AZ, mid-July through September, 2014.